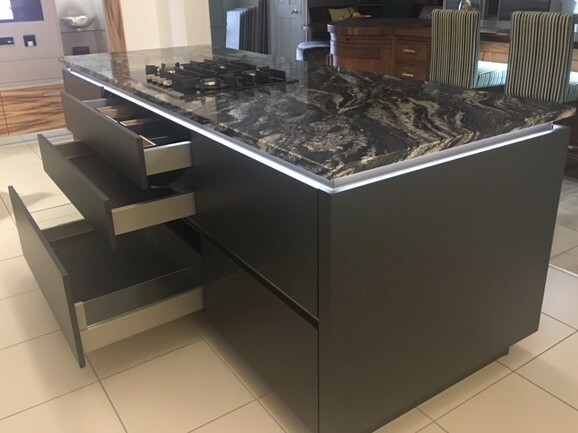 Our new showroom design is finally installed in the downstairs showroom and is a real show stopper, with a fabulously bold granite called Black Wave. The island furniture is Graphite Black Velvet and the perimeter furniture is Snow White in a high gloss lacquer. A Miele dark hob on the island is in keeping with the muted colours and LED strip lighting around the island gives added interest. The dropped ceiling above the island is a great feature and has lighting above it to create a soft glow. The ceiling extractor is by Siemens. The inside of the island drawers are a combination of anthracite metal with attractive oak inserts. Pantries are back in fashion. It’s official.